The Federal Highway Trust Fund is going bust this year. In fact, it goes bust every year. According to the Committee for a Responsible Federal Budget (CRFB), federal highway spending has exceeded dedicated tax revenue in 13 of the last 14 years. The shortfall is projected to be about $15 billion this year and $170 billion over the next 10 years. 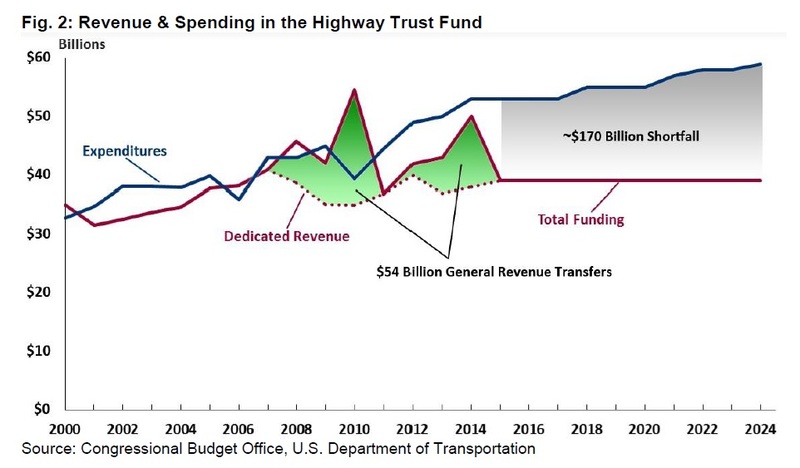 As shown in their chart, replicated below, highway spending is projected to roughly double from 2000 to 2024 while dedicated tax revenue is basically flat. Certainly spending could be reformed and reduced, as many have proposed, but there is something wrong with a dedicated revenue source that is flat for 14 years, and in fact shrinking as a share of GDP. The main source of tax revenue for the Highway Trust Fund is the federal gas tax of 18.4 cents per gallon. According to CRFB, the gas tax makes up 47 percent of dedicated Trust Fund revenue, followed by 19 percent from a 24.4 cents per gallon tax on diesel and other fuels, and 9 percent from other taxes and fees on heavy vehicles. There are three reasons federal gas tax revenue has flat-lined in recent years: 1) the gas tax is not indexed to inflation and was last increased in 1993, 2) engines are more efficient now, and 3) people are driving less. To deal with this, Senators Murphy and Corker have proposed raising the gas tax 12 cents and indexing it to inflation. This would put the gas tax back to where it was in 1993, in inflation adjusted terms. However, conservative groups have labeled this a huge tax increase. 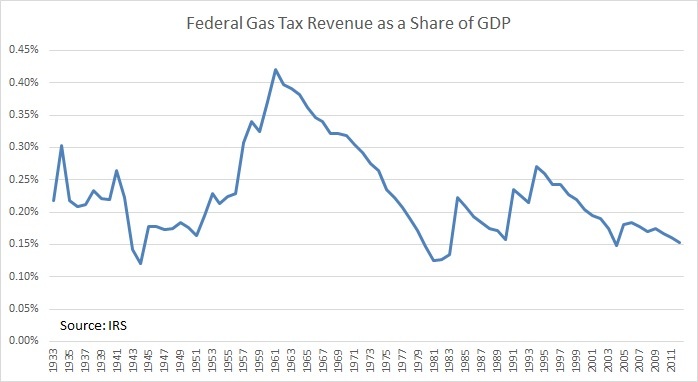 The chart below shows that federal gas tax revenue has been falling as a share of GDP since 1993, and is in fact lower than at any time since 1983. So apparently we’ve been giving ourselves tax cuts all these years. Clearly, the gas tax should be somehow linked to inflation, if we don’t want it to erode every year. Alternatively, Congress should come up with a better way to fund highway spending, one that, like the gas tax, falls on those who use the highways. Tolling would work. If instead, Congress continues to shift the tax burden away from highway users, either through general revenue transfers or taxing corporations, there will continue to be too many drivers on the roads. Paying higher gas taxes or tolls to use the roads is not fun, but neither is sitting in traffic.